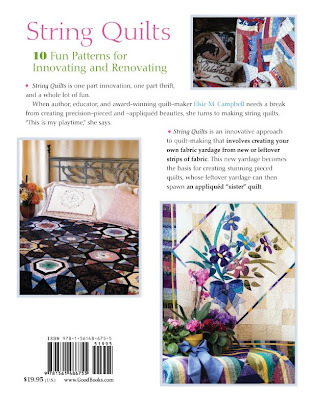 Elsie M. Campbell and Aunt Mimi's Quiltworks: Announcing a New Arrival! 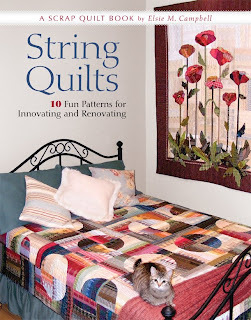 STRING QUILTS is on its way! Just got word on Friday that the books will arrive in a couple of weeks, so here's the big announcement. Sally the Kitten (now Cat) is on the cover. Surprise! I didn't know exactly which photo the book designer chose for the cover until I got the e-mail with the front and back cover in it. Pretty excit ing! Until Sept. 1, I'm accepting advance orders for the book at $16.96. That's 15% off the full retail price of $19.95. These advance orders will ship on or about Sept. 1, 2009. Check it out on my website. Your quilts are gorgeous. I cannot for the life of me figure out what you did to get banned from Stashbusters -- in fact I went back to read all the posts and I still can't figure it out. But just a quick look through your blog shows me how talented you are. Perhaps some are just jealous-- I don't know. Thanks for your kind words. I choose not to comment, for fear it will feed the flames. It is difficult to understand why others are getting kicked off the list, too, for voicing their honest opinions.